(Oregon Coast) - Some are quite obvious and out in the open, with Battery Russel and the blimp hangar at Tillamook being the most recognizable and easily found leftovers of World War II on the Oregon coast. Other examples of how this state helped with the Last Great War get less and less obvious, until some become downright legends or even mysteries. Still others are hiding in plain sight. 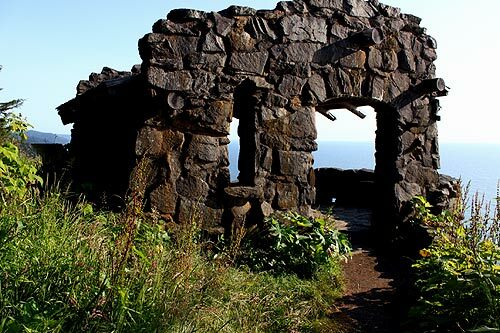 (Above: the stone shelter at Cape Perpetua). 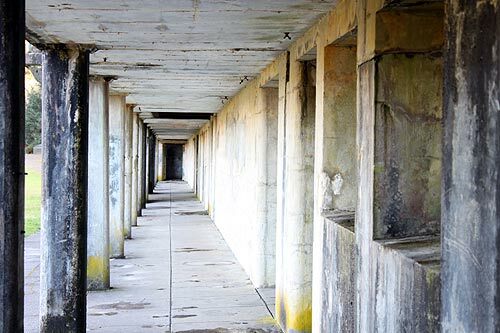 Ever wondered what remnants of World War 2 still exist along the Oregon coast? What artifacts you could look at? What structures still stand? 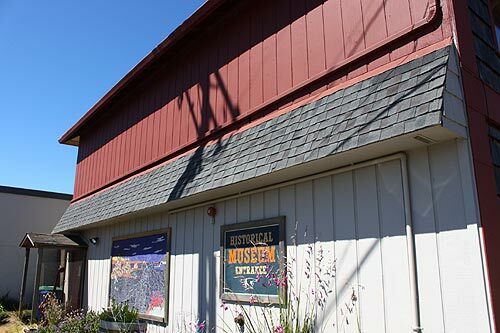 There are quite a few, actually – even more if you count the objects and documentation you can discover in some of the local history museums. Here, however, is a guide to many of the places and things you can visit that have a World War 2 story behind them. In Warrenton there's Battery Russell, at what is now Fort Stevens State Park, which was the big watch dog of the Columbia River during wartime, going all the way back to the Civil War. But it's more famous for being the only chunk of U.S. ground fired upon by a foreign power in about 200 years (until 9/11). Just before midnight on June 21, 1942, a Japanese submarine lobbed shells towards the fort, making a few craters in the beaches nearby. The fort did not fire back lest it give away its location to the enemy. In later years, that Japanese sub commander admitted he had no idea what he was firing at. 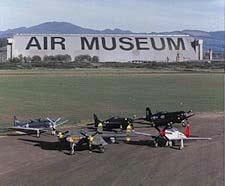 There is a plaque onsite regarding the event, which included a dedication by vets from Fort Stevens and the attacking sub. 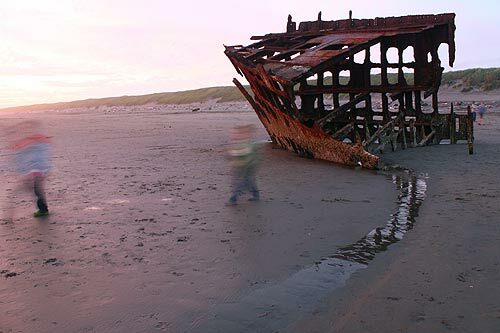 The nearby Wreck of the Peter Iredale was used in a tiny way in the war effort. Much of Oregon's beaches were covered in barbed wire during the war, and the Iredale actually had some of the wire wrapped around it. The village of Cape Meares (on the north face of the headland of the same name) had a disturbing visit from a Japanese sea mine in 1953. A young man found it lying on the beach one day that winter, and locals had set up a quarantine around it to keep people away as they waited for officials. One night, the ocean got to it and started causing it to rock back and forth. The object exploded suddenly, just minutes after a young man went down to check on it with a flashlight. There was only a small bank of sand that protected him from the blast, and the explosion was heard miles away. In Oceanside, there was a radar station. You can still find Radar Road where it was, a couple miles north of town. It is rumored a cannon was placed at the secret beach just behind Maxwell Point, to stand guard against any invaders. It's unclear if this is true, however. In August of 1943, a B-17 Flying Fortress bomber crashed into Cape Lookout, killing nine men. The craft was on a training run out of Pendleton and hit foggy weather, somehow managing to fly too low by 50 feet, slamming into the headland at 200 mph. There is a plaque now along that trail that memorializes the crash and lists the 10-man crew by name. For a few decades, scavengers did manage to take some objects from the wreck, but the site is hidden now and too dangerous to approach. Crazier still is the mysterious story of a patrol boat that apparently sank at least one submarine – but not necessarily Japanese - about ten miles off of Cape Lookout. The incident, rather hotly debated, actually involves Scientology founder L. Ron Hubbard in command of the vessel. According to the story, he was in charge of a sub chaser called SC-536, stationed out of Astoria, sent to investigate radar pings of at least one submarine off the Oregon coast on May 19, 1943, accompanied by two military blimps. Many crew members of that boat have sworn by that version of events over the years, but any other serious evidence is missing. The famed Spouting Horn restaurant in Depoe Bay was briefly used as a U.S. Coast Guard headquarters during the war years, as they assisted in patrolling the Oregon coast for any enemies. In Newport, the concrete barge S.S. Paisley, left over from World War 2, was sunk in Yaquina Bay in the 50's to provide solid ground for a log shipping terminal. That chunk of debris started creating an environmental hazard in the 90's and was removed. When you look at the airports of Astoria, Newport, North Bend and Tillamook, you're looking at airfields originally constructed during World War II to for defense purposes.